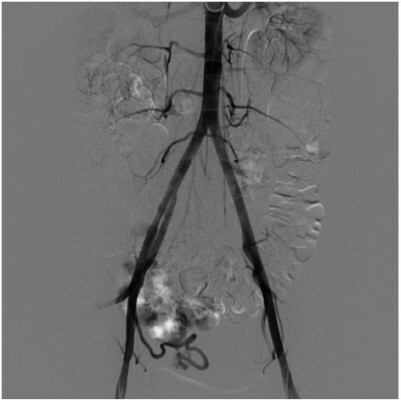 Objective: This paper reports on a rare case of pregnancy after uterine artery embolization (UAE) for uterine arteriovenous malformation (AVM). Debate exists about persistence of fertility in women after UAE. Adverse effects of this technique can modify both uterine echostructure, inducing necrosis and infarction, endometrial atrophy and uterine artery rupture, and ovarian reserve, causing persistent amenorrhea. Ovarian reserve appears to be affected by UAE in premenopausal women. However, younger ovaries (according to biological ovarian age) exhibit a greater capacity for recovery after ovarian damage. Therefore, larger studies are needed for more conclusive results. Case report: A 28-year-old woman was admitted to our department due to life-threatening uterine bleeding, resulting in tachycardia, pallor, and sweating. The patient came with a history of two spontaneous miscarriages. After sonography and computed tomography, AVMs were identified at uterine fundus and anterior wall. Conclusion: The pathogenesis of infertility after UAE is not yet known. The peculiarity of this case was that, only few months later, the patient became pregnant and gave birth to a live fetus at 37 weeks with cesarean delivery.